Ever since Cambridge announced plans to release the New Cambridge Paragraph Bible, I've been getting e-mails from around the world. Since I've campaigned (or at least, complained) long and hard for a modern, single-column setting of King James Version, you can imagine with how much excitement I greeted both the announcement and the periodic reminders. I pre-ordered a copy from Amazon as soon as they were listed, but months passed and the order was never filled, so I canceled the order and placed another -- then canceled the second order to place a third. Amazon always claimed the thing was in stock and ready to ship, but they never shipped it. Finally, I broke down and ordered it through a re-seller. When it arrived, I sat down with the New Paragraph Bible and spent several hours turning page by page to unstick the gilt edges and let the pages flow free. By the time I was done, I'd formed some definite opinions. WHAT IS THE NEW CAMBRIDGE PARAGRAPH BIBLE? The name derives from the original Cambridge Paragraph Bible, a late nineteenth century edition edited by Frederick Scrivener. The new editor, David Norton, undertook the task of researching the textual choices of the original translators and restoring them. The KJV never had a single, definitive "first edition." Errors and variants were introduced almost immediately, and over the centuries various editors have attempted to make amends, updating spelling, punctuation and even wording. The last major revisions (apart from Scrivener's) were made in the eighteenth century. Now, Norton brings spelling and punctuation up to twenty-first century standards, while at the same time restoring the translation itself to its pure, seventeenth century origins. Of course, the title says it all. This is the New Cambridge Paragraph Bible, so named because the KJV text is presented in paragraph form instead of the annoying traditional style, which inserts line breaks after every verse. I've argued in the past that one of the reasons contemporary readers -- even some well-educated ones -- have difficulty reading the KJV text is that it is invariably set in an archiac, unreadable style. In contrast, the New Cambridge Paragraph Bible is pleasure to read. The type is set elegantly in 10 pt. Swift, as befits the text, and the paper feels nice to the touch. Laying open on the table, the New Cambridge Paragraph Bible is an impressive sight. 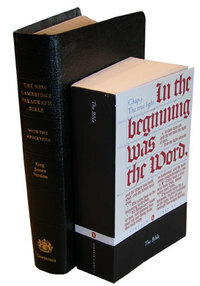 Fans of the King James Version ought to love this edition. There really is nothing like it. The single-column text allows plenty of room in the margin for the translator's notes, many of which are missing in other editions. Also included (as it should be with every copy of the KJV) is the introductory epistle titled "The Translators to the Reader," a well-reasoned defense of the translation and an exposition on translation theory in general. Many of the errors of twentieth century "King James Only-ism" would have been impossible for congregations to swallow if they'd been able to see what the translators themselves had to say. As far as I'm concerned, there is no justification for double column text settings. Think about it. The only type of books that still use double columns are reference works. The Bible is not a reference like a dictionary or thesaurus. It is meant to be read, and ought to be designed like the books people actually read. The New Cambridge Paragraph Bible gets this right. My only reservation is with the decision to place the generous margin that contains the occasional textual notes on the inside gutter. On the positive side, this insures that the text is never swallowed in the crease the way it is with many other editions. On the negative, it means that the margin cannot be used effectively for note-taking, which would have been a nice touch -- especially considering how large this Bible is (but more on that in a moment). The New Cambridge Paragraph Bible also lacks a concordance. I imagine the thinking behind this omission was that if the original editions didn't have one, the restored edition shouldn't, either. That's fine, but the decision makes it that much harder to use the New Paragraph Bible for personal study or teaching. Of course, that oversight pales in comparison with the two I'm about to harp on: the New Cambridge Paragraph Bible's binding and size. Let's address the binding first. It's no secret among connoisseurs that Cambridge Bibles aren't what they once were. The quality of materials and production has declined over the past ten years or so. There was a time when I was confident that a Cambridge Bible would be better than any other on the market, but not anymore. The New Cambridge Paragraph Bible is a victim of the decline. According to the description printed inside, it is bound in French Morocco leather. My example bears no stamp on the cover itself to confirm this, and all I can say is that if the thin, hard substance used on this Bible is indeed French Morocco, then French Morocco isn't what it used to be. After minimal use, the edge of the cover is already curling away from the book. As far as I can tell, the binding itself is excellent. I just wish Cambridge had used a finer material for the cover, one that measured up to the magisterial nature of the project. As a result, my advice to shoppers is to handle the Bible in person before buying. That might prove difficult, I suppose, given the lack of availability, but if you can manage it, please do. In my experience, there is a wide range in quality between Cambridge Bibles of the same time bound in the same leather. For example, I have two copies of the wide margin KJV, both bound in calfskin. One is soft, supple and a pleasure to handle. The other is stiff as a board. Hopefully there are nicer examples of the New Paragraph Bible floating around out there. Now, I need to offer a lament about the size of this thing. I was really hoping the New Cambridge Paragraph Bible would be issued in a usuable format. The inclusion of the apocrypha adds thickness to the volume, but still, this Bible is far too big! For comparison purposes, I stacked it against Crossway's bulky Heirloom Edition of the ESV -- which most people agree is too large for practical use -- and the ideally-sized Allan's Reference Edition of the ESV. As you can see from the photo, the New Cambridge Paragraph Bible dwarfs them both. It's actually bigger than any of the Study Bibles I own, in spite of the fact that it doesn't have any study notes, concordance or maps. I would have gladly put up with smaller type to have an edition of the New Cambridge Paragraph Bible I could take with me to church and enjoy. I share the hope of the Church Times reviewer that Cambridge will use the new text and layout in other, handier editions of the KJV. They didn't do this with Scrivener's edition, now all but forgotten, and I fear that Norton's will go the same route -- reserved entirely for scholarly use -- if Cambridge does not introduce a more practical edition at some point. (An edition from Penguin is also available -- see below.) For the evangelical market, of course, where the KJV still sells well, a smaller edition sans Apocrypha would probably be the key. Here's the part where I wax philosophical. I seriously doubt whether we are going to see a single English-language translation enjoy the kind of popularity the King James had for four hundred years. Even if the various divisions of the church were to settle on a single version -- which seems unlikely and might not even be a good thing -- the resulting "authorized version" would not have the cultural impact that the KJV has had, because Christianity no longer has that kind of clout. For Christians without much sense of the past, who find the King James difficult to understand and pointless to grapple with, that might not seem like such a tragedy. But I'm not one of them, and I think it is. That's why anything that can get Christians interested in the King James Version -- for the right reasons -- is going to get my unstinting approval and support. The Cambridge New Paragraph Bible falls into that category. Until Cambridge makes it available in better, more practical editions -- and let's face it, they've hardly made it available at all so far -- the New Cambridge Paragraph Bible isn't going to reach the audience it should. The only thing that might change that is if some fanatical early adopters can generate interest. Bottom line: if you love the KJV, then this Bible should be on your shelf. In fact, in spite of the size, you should make it a point once in awhile to bring the thing to church, show it off, and try to win an adherent or two. That's my plan. When this article originally appeared, the Penguin paperback edition of the New Cambridge Paragraph Bible was still in the future. Now, it's on the market, available at Amazon. Like the leatherbound edition from Cambridge, it is a bulky book -- but the paperback is considerably handier than its high end cousin, as you can see from the comparison photo at left. The textual notes are absent in the paperback, but some helpful backmatter has been added: maps and extensive introductory notes on individual books. The paperback includes the epistle dedicatory but, unfortunately, not "The Translators to the Reader," in which the KJV translators explain and defend their work. My first question, of course, on receiving the Penguin edition was whether the glued binding could be re-sewn and the whole thing fitted with a nice leather (or possibly hardback) binding. I'm no expert, but I think the inner margins are a bit too narrow to permit this without dragging the edge of the text into the gutter. If anyone manages to pull it off, though, I'd like to know. One of my initial concerns about the New Cambridge Paragraph Bible was that, because of the impractical format of the first edition, it would fail to find traction in the marketplace. So far, Cambridge continues to print the KJV in the antiquated verse-per-paragraph settings most of us are familiar with. Until they decide to use this setting in their 'regular' KJV formats, it will probably remain a niche product, a novelty -- which is really a shame. The Penguin edition will help by making a handier, more practical version available at an attractive price point. Still, I'd love to see the 'guts' of this edition transplanted into a hand-sized, goatskin binding, or even a clean, modern hardback like the ESV Journaling Bible. This is how the KJV ought to be experienced. Norton's magnificent edition, coupled with this splendid, paragraphed setting, makes for the most accurate, readable King James Version available today. With any luck, Cambridge will transition its existing, old fashioned KJV settings to this new one and help introduce an amazing piece of scholarship to a much wider audience. Until that happens, the Penguin paperback offers an affordable, relatively handy introduction to the New Paragraph Bible.